Has the petrol engine been confirmed? Do we get the 1.8 or 2.0? I'm in the market, seeking a replacement for my Civic. I would love to continue the love affair if it's a worthy upgrade. My sources tell me that the 1.8 petrol will be on offer. Let me still re-confirm it for you. For a car which is about to launch in a few weeks, the lack of buzz and excitement (not just here, but internet-media in general) is surprising. That too, for a nameplate which enjoyed a pretty respectable brand value and following in the past. Has Honda killed the excitement by not bringing in 1.5 Turbo petrol? 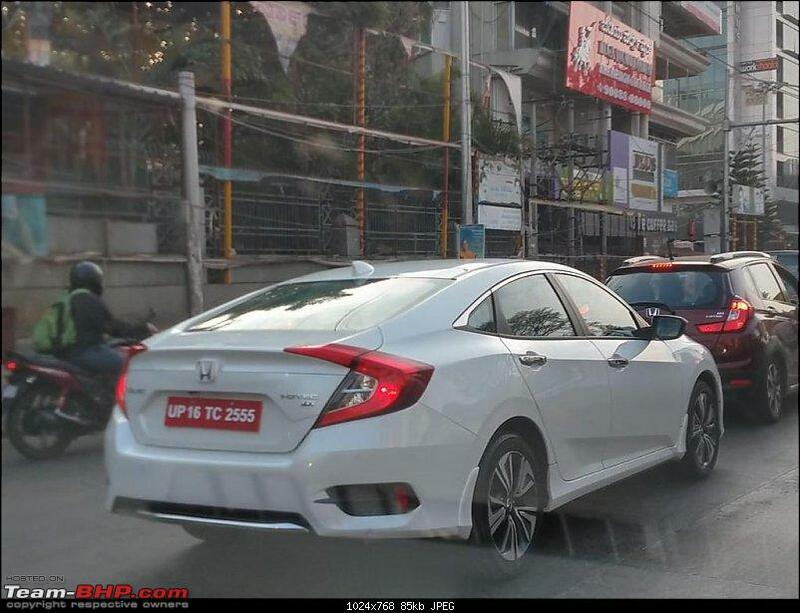 I saw the new Honda Civic this morning at Madiwala, Bangalore on my way to work. It was completely undisguised. UP 16 registered. White. iDtec (yes, diesel). Looked like the top end version since I also noticed a curious thing sticking out of the corner of the orvm. Looked like a camera or some sort of sensor for blind spot vehicle detection. It looks like the launch of the new Civic is imminent. 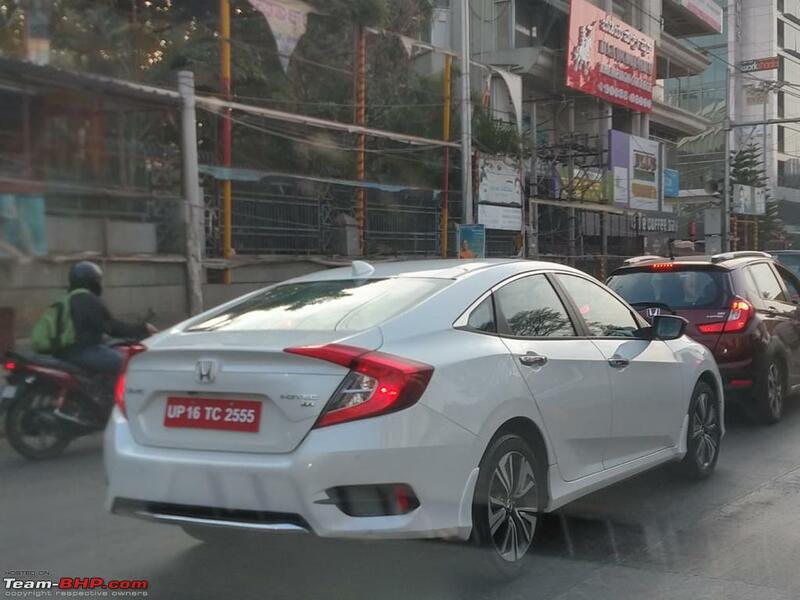 I saw the new Honda Civic this morning at Madiwala, Bangalore on my way to work. Yes, the launch definitely seems to be just around the corner. Saw a deep red/ maroon Civic being driven at Richmond Circle with temporary numbers plates. Completely undisguised. Could not take a photo as I was travelling at speed on the other side of the road across the divider. Car looked quite long and low, much like the earlier gen Civic . Somehow the design just didn't seem to have the same class and cohesiveness which the earlier gen car used to have. Too many cuts, creases and swoops kind of make it a design overkill. Last edited by arindambasu13 : 8th February 2019 at 09:31. Think about it - when Honda launched the original Civic with the SAME engine in 2005(! ), it was the MOST powerful engine in a segment that generally had naturally aspirated engines. Now, when Honda offers the SAME engine at time of launch, it will be the LEAST powerful engine in its segment in 2019 (!). After 14 years of soldiering with the same engine.. 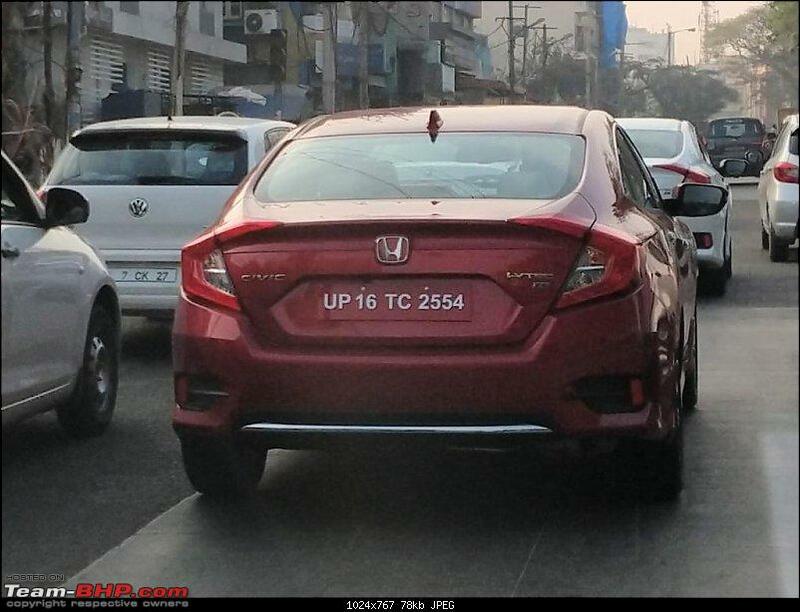 In today's day and age of Mahindra/TATA offering turbo petrols in cars that cost less than half of Civic, offering a N.A 1.8 l petrol engine in Civic is a sin. This too in petrol engines, which is supposed to be Honda's strength!! How the times have changed? When I bought by first car in 2006 (Santro), I used to drool over the Civic and it was always my dream car. One of my friends actually took a huge loan and bought it, so I had the chance to drive it quite a few times and it was so much ahead of its time - the performance, the cockpit like speedo and dashboard, the smooth flowing design. 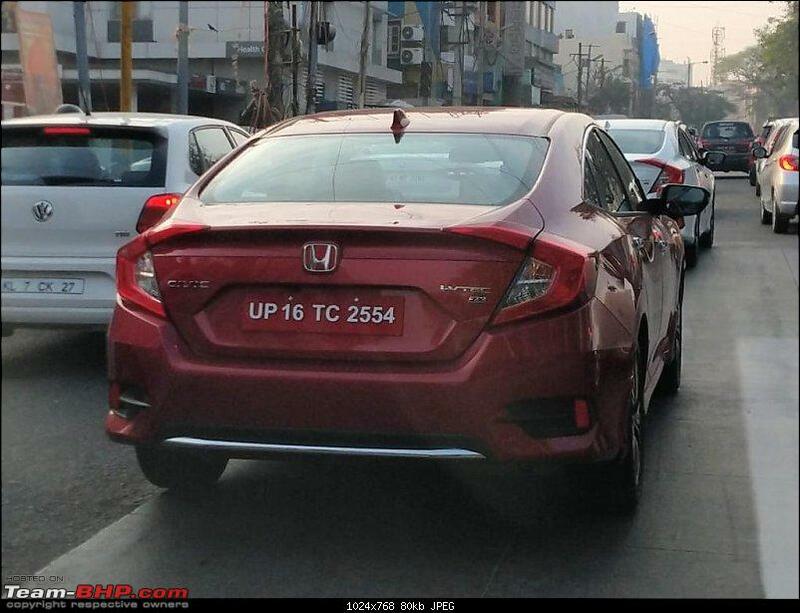 Now fast forward 13 years, and I am actually looking to upgrade (currently drive a 9 year old Jazz which is running strong) and coincidentally the Civic is also getting re-launched. But guess what - it is not even in consideration. FIrst of all, the D-segment sedan is virtually dead. People want SUV/crossover, period. People want high ground clearance and vehicles which can take rough roads with ease and comfort. Secondly, apart from some new electronic gadgetry, the new Civic does not offer anything over the 15 year old model. I can't even think that Honda is offering the same petrol engine. There must be something wrong with Honda India and the half-hearted manner in which they launch products here. I see this getting launched and then vanishing quickly into oblivion without much of a whimper. Sad but true! Last edited by Gannu_1 : 9th February 2019 at 09:35. Reason: Typos + splitting into paras for better readability. My Honda Civic is still running strong and has done 150,000 kms last week. Thankful to her for being with us through thick and thin. We have upgrade plans into either the upcoming BMW 3-series (will have to strech the budget here if civic is not worth it but its the only second choice of the family) or the New Civic (I know two different rides in class and quality but this will make New Civic compete with the very best in my mind and it needs to be 60-70% of the 3 in terms of equipment and quality to become family!). The main criteria here is to have a good sized luxury sedan in the house that replaces our 2007 model civic with the following basic tech that I have been missing out on and want in the new car: LED Lights (a must as I do a lot of highway night driving and i hate the throw of halogens without projectors, an extinct tech in big vehicles), Sunroof, minimum 17-inch wheels as 15 inchers of 2007 Civic now feel puny, rain sensing wipers (gimmick but me want! ), cruise control, rear view camera, classy leather upholstery (got mine from Autoform but want it from the factory), Automatic Transmission (finally and absolute must as my knees are wearing out at 33 with gearchanges and long weekly highway trips! ), touchscreen with apple carplay and better music system that the current civic i have. I would also be closely looking at the new civic’s ground clearance and suspension setup as i dont want this soft suspension again, tired of it bottoming out on almost every trip with luggage, my pulse has gone faster by a few beats per minute since the time i got my civic . Wonder why the scissor wipers of old gen Civic, that was a huge talking point has been removed, it would have been pretty cool. Also I would prefer crome instead of piano black front grill as we Indians love the bling more IMO. This time also I want the ride to be in white as the last time but don’t mind black seats. The new civic’s remote ignition-on feature if it makes it to India will be a great plus! These all and some more will make me feel thrown right into 2019 from where I am currently that is in ancient 2007. Civic Automatic Petrol in its top variant at 22 Lacs OTR and I am sold! 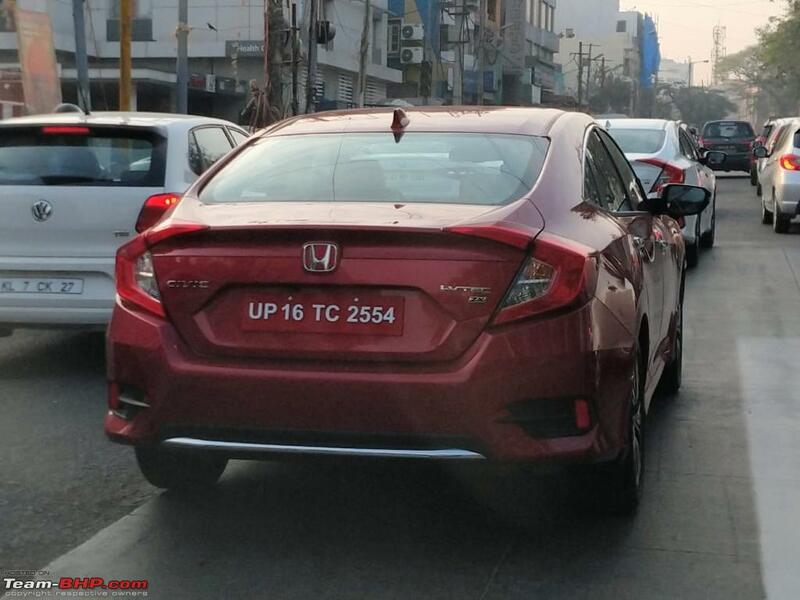 The strong possibility of Civic going to be a dud in its second venture into the Indian market genuinely saddens enthusiasts like us. When the market has moved strongly to SUVs Honda is having a crack at the D segment. As pointed out by GTO, when established players are managing just 300 cars a month, how can Civic fit in between with its premium pricing? This brings to my mind the quote by Arun: Honda has a method to its madness or only madness without any method? Launching Civic just for the sake of image boost can hardly be termed wise. 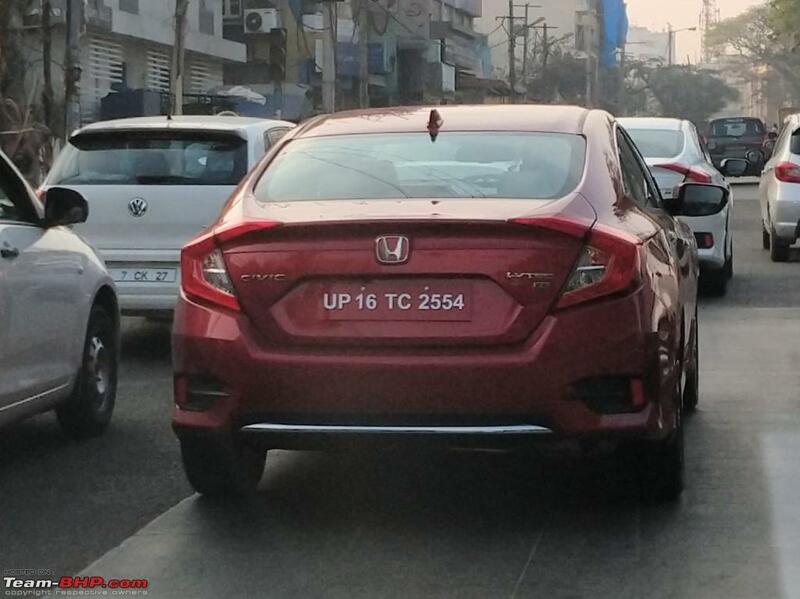 Indeed it will be a wasted opportunity for Honda when I think how they could have introduced the Civic hatchback to compete in the C segment or a makeover to the BR-V to milk the SUV craze. Notwithstanding the looks of the new Civic, there is very little prospect for it with Honda’s premium pricing strategy. That the Civic brand is close to many of us further pains me and I am hoping against hope for a competitively priced D1 sedan. Honda Civic has an extremely high fan following among the general buyers as well as the auto enthusiasts. It's a cult. Just a few days back, a few guys were checking out my Civic and one of them commented "This is what a true masterpiece looks like!" Imagine a vehicle which was launched in 2006 is still receiving compliments in 2019. Do I need to say more? I think, I can safely say no one bought the Civic for it's practicality. The enthusiastic bunch got it for the R18A. The general buyers bought it for it's futuristic interiors and that arrowhead design was an icing on the cake. It was one vehicle which appealed to your father as well as you because there was nothing wrong in that car which would have been a deal breaker for anyone! Honda is targeting us, the existing buyers and the people who always aspired to own a Civic. The new Civic has simply improved things further. The design is extremely unique for the Indian market in the D Segment, the interiors of Honda are practical and fairly well equipped now. The mile munchers have an option of Diesel. Again, I cannot find anything which could be serious deal breaker or something which makes it any less to it's competition. A lot of Corolla Altis & Elantra buyers are going to take a look at the Civic. The German buyers too are going to take a look at it simply because of the reliability Japanese offers. I know a number of people who bought Octavia simply because there wasn't anything exciting enough in the market which brings in my another point. The Elantra & Altis were never performance oriented, I drive a 2013 Corolla Altis as well as Civic and I can give it in writing that the Civic is leaps and bounds ahead of Altis in terms of performance & handling. Hence, Civic is the vehicle which is a jack of all. It has great performance, a well balanced Ride & Handling along with the right basics anyone buying a car in this range wants. Additionally, the emotional connect which people has with Civic is going to play a huge role. The Octavia's success is one such example. Civic Automatic Petrol in its top variant at 22 Lacs OTR and I am sold! Just to understand the thought process of an existing CIVIC owner, wouldn't you look at adding just a couple lacs more to this price and get the Octavia 1.8 TSI, a far superior, turbo engine that makes 180PS, as well as the quick-shifting DSG? I'm guessing all other creature comforts would remain the same, and the Octavia is pretty decently equipped, and does have all the other features that you mentioned. Just curious. I'm a civic fan myself, but can't help compare this new launch with the existing Octavia. As a potential Civic buyer, the only reason stopping me from looking at the VW or Skoda stable is the perceived after sales - even though all indications are that they have improved. Having owned Honda vehicles for the past 16 years, even though the cars may not be enthusiastic to many, the peace of mind ownership and after sales is what keeps me in the same ecosystem. I think even though it says ZX, the lit-up tail lamp in this pic doesn't seem LED to me. I might be wrong though. Overall I feel the iconic, classic design of the CIVIC we had earlier is lost. Now it's just a bunch of sharp creases, curves and what not. Last edited by Parth46 : 11th February 2019 at 09:32. I am a petrolhead who has owned a Civic for nine years. Lovely car, I would love to see a 1600 or lower petrol engine. Why the insurance rates are far lower. With my 1.8 and full NCB over 75% of the premium goes into the Third Party cover. I am told if we went to 1600 or lower the premium will be far smaller. The Comprehensive with maximum NCB and damage waiver is hardly anything. All times are GMT +5.5. The time now is 18:28.